Fanny Finch’s 1856 voting card. On 22 January 1856, an extraordinary event in Australia’s history occurred. It is not part of our collective national identity, nor has it been mythologised over the decades through song, dance, or poetry. It doesn’t even have a hashtag. But on this day in the thriving gold rush town of Castlemaine, two women took to the polls and cast their votes in a democratic election. Two days later, Melbourne newspaper The Argus unwittingly granted one of them posterity, writing “two women voted – one, the famous Mrs. Fanny Finch”. Fanny Finch was a London-born businesswoman of African heritage, a single mother of four and is the first known woman to cast a vote in an Australian election. Victorian women over the age of 21 (excluding Indigenous women) would not receive full unconditional suffrage until 1908. (Victorian Indigenous women were not enfranchised until 1965.) But Fanny Finch, as a local business owner who paid rates, was able to exploit a loophole in suffrage law that was yet to discriminate against gender or race. The Municipal Institutions Act of 1854 granted suffrage to ratepaying “persons”. The loophole was eventually closed in 1865 when “persons” became “men”. Argus report excerpt, 24th January 1856. Frances Finch was born Frances Combe in London in 1815. At eight-weeks-old she was orphaned by her mother after a tryst with a footman ended in a pregnancy but no marriage proposal. A cross-stitch sampler attributed to Frances Coombe (sic) in 1830 at the age of 15 suggests she understood both her parents to be free people of African racial heritage (although the UK did not free slaves unconditionally until 1838.) The London Foundling Hospital, where Fanny was accepted as an orphan, provided her with some protection against slavery as well as an otherwise inaccessible education and access to an apprenticeship scheme in “household duties”. Sampler attributed to Frances Coombe (sic). By 1837, a 22-year-old Fanny was a free, literate, educated, and experienced domestic servant. In that year she was approved a labourer’s free passage to the new colony of South Australia. In Adelaide, Fanny was a valued employee of Julia Wyatt, an author, artist, and wife of the surgeon and first Protector of Aborigines, Dr. William Wyatt. Over the course of the next decade Fanny left their employment, married a sailor, Joseph Finch, and started a family. By 1850, for reasons unknown, Fanny had left her husband. With her four children in tow, she made her way to Victoria. She arrived in the colony 12 months before the start of the Victorian gold rush. By early 1852 she was operating a restaurant and lodging house on the Forest Creek goldfields, alongside approximately 25,000 gold digging men and a handful of women. There, in the fledgling township of Forest Creek, Mrs Finch’s Board and Lodging House became “the only one in which any person could get respectable accommodation”. By 1854, she had moved to nearby Castlemaine where she ran a restaurant. She quickly became one of its most recognisable faces. Fanny Finch’s Restaurant, Corner of Latimer’s Lane and Urquhart Street, Castlemaine, c1858. Fanny was a successful businesswoman, known to dress in bright blue silk with her black hair adorned in artificial flowers. Strong and robust, with an even larger personality she was not one to shy away from attempting to remedy injustice when she saw it – be it with her words, her cooking or her fists. Evidently, she possessed visibility and power. Her business acumen and conspicuity make it probable that her male contemporaries were unsurprised when they witnessed Fanny cast her vote at the Hall of Castlemaine (now the Theatre Royal). Did the men taunt her? Encourage her? Or were they complacent? We cannot know. We do know that no one stopped her. She selected her preference and signed her name. Market Square, Castlemaine, c1855. By S.T Gill. The Hall of Castlemaine where Fanny Finch cast her vote can be seen to the right of centre. That afternoon, however, the two assessors of the day disallowed both Fanny and the other unknown woman’s votes. Their reasons were cited as: “they (the women) had no right to vote”. Further details were not divulged. Still, Walter Smith, the man for whom Fanny voted, was elected to council. Smith was an agent and brewer who arrived at Forest Creek at around the same time as Fanny. Little is known about what motivated her to vote for him but no one else, despite being allowed to vote in seven councillors. She was clearly determined to elect him to council. During colonial times women were rarely identified by name in the press – particularly women of the working class. The 1856 Argus report now offers historians an unprecedented opportunity to identify an otherwise invisible minority – the 19th century Australian woman of colour – as an active participant in our political history. Fanny was a woman, who, through relative privilege – wielded with her own blood, sweat and tears – refused to founder beneath the weight of a white, Anglo-male world of commerce. However, this came at a price. As a woman of colour occupying space in a white man’s world, assaults on her success were not uncommon. Yet she refused to disappear. One of those assaults occurred in December 1855. Fanny Finch was fined £50 for the illicit sale of alcohol, known as “sly-grogging”. After a month-long trial, which involved scandalous cross-examinations of miners, policemen, and even her two young sons, she was charged and fined. Despite the exorbitant fine and the public slandering of her character and commercial integrity, Fanny Finch was not defeated. Like many business people on the goldfields, she both owed money and was owed it by others, but over the following four months, she began an unprecedented campaign of self-representation. The day following her conviction she published a letter in the local paper accusing the local authorities of injustice (a copy of this has not survived). A month on, she cast that vote. Then a few months later in April, she published the following advertisement. Mrs. Finch begs to inform the inhabitants of Castlemaine that henceforth she will carry on business for her children and would be happy to receive any outstanding debts … finding that the more she herself strives the more she is oppressed, although she can firmly state that if those who are in her debt would come forward each with one third, she will be relieved of all debt, have a good home for her family and about two thousand pounds in her pocket. Fanny Finch also begs to state that as in her affluence she was so kindly trusted, they may be sure that she, from her own free will, may some day liquidate all, but she must have her time … and in spite of what enemies she may have, she intends to keep throughout the winter ready cooked Ham, Beef Soups (a la mode) from seven in the morning to seven in the night. The vote of the famous Mrs. Fanny Finch adds a woman of colour’s voice to what Clare Wright has described as an unorganised movement for women’s rights during the 1850s. Fanny died on the 15th October 1863, aged 48. She was remembered as “a strong minded woman” with “a genuine tenderness of heart, ever ready to serve another in distress … without the slightest ostentation”. She was given a public burial in an unmarked grave at Castlemaine Cemetery. Isabel Letham tandem surfing with Duke Kahanamoku in 1916. When we think of Australians who made history in 1915, the rugged Anzac is the figure who first springs to mind. A century after the Gallipoli campaign, that year has become near synonymous with the mythologised soldiers who fought and died in the Dardanelles. But months before Australia’s so-called “baptism by fire” began at Anzac Cove, a more joyful baptism drew crowds to Sydney’s northern beaches. There, in January 1915, local 15-year-old Isabel Letham was inducted into the mysteries of surfing, becoming one of the first Australians to ride the waves. This was the early days of Australia’s beach culture, as public bathing had only been legalised a few years before. Surf boards were almost unknown, and beachgoers instead entertained themselves with body surfing—then known as “surf shooting”. Into this scene arrived Duke Kahanamoku, an Olympic swimmer and famed surfer from Hawai’i, the home of modern surf culture. Kahanamoku had been visiting Australia to test himself against local swimming talent, but was convinced to add a surfing demonstration to his itinerary. Sydneysiders were keen to see the handsome Polynesian show off the unfamiliar sport, and punters lined the sand of Freshwater beach. Once in the waves, Kahanamoku decided to enhance the show with a tandem demonstration, and invited Letham to join him on the board. They made a striking couple: Kahanamoku was tall and muscled, while Letham was lithe and vivacious, her skin bronzed from long days at the beach. The duo were a local sensation, and Letham was hailed as the “Freshwater mermaid”. Thanks to the visiting Hawai’ian, both surfing and Letham were now big news. Isabel Letham surfing circa 1916 or 1917. Emboldened by this Australian celebrity, Letham decided to try her luck on the silver screen. The US film industry was taking the world by storm, and Hollywood was the place to be. Leaving school at 16, Letham found employment as a sports mistress at elite girls’ school Kambala, and also worked as a private swimming instructor. By August 1918, she’d saved enough for a fare to California. The war was still raging but that was not enough to deter her. Still only in her teens, Letham set sail on the SS Niagara, the “Queen of the Pacific”. She travelled alone and with only the vaguest outline of a plan. Letham had no luck in Hollywood, but nonetheless revelled in the freedom of life abroad. She tackled the waves at Waikiki, partied with Russian aristocrats in New York, and lived a bachelorette lifestyle in Los Angeles, hairdressing to pay the bills. In California she continued to turn heads with her surfing skills, known as “a young Diana of the waves”. Although she returned to Sydney in 1921 to nurse her ailing father, Letham was lured back to California soon after his death in 1923. This time, she settled in San Francisco, where she became a celebrated swimming instructor. At first, Letham worked at the University of California, Berkeley, where she developed expertise in modern approaches to swimming pedagogy, which stressed the technical mastery of each stroke. Later she taught children at San Francisco’s public baths, and in 1926 was appointed swimming instructor at the luxurious City Women’s Club, an institution which boasted “the most beautiful indoor pool on the Pacific coast”. Having decided that “opportunities in the States were high for women”, Letham had adopted US citizenship in 1925. She was, by this point, a modern woman par excellence: economically independent, physically daring and unapologetically ambitious. One of her ambitions was to introduce Australian-style beach safety patrols to California, where swimmers drowned at an alarming rate. In 1925, she had reached out to the Sydney lifesaving community to get them on board. To her dismay, this idea was scuttled when Sydney’s surf clubs refused to grant Letham membership. “We do not teach ladies the work”, decreed the president of the national Surf Life Saving Association. Without any formal affiliation to the lifesaving movement, Letham found it nigh impossible to carry its message overseas, and her plan to export Australian expertise and reduce Californian fatalities came to naught. In 1929, disaster struck. Letham fell down a manhole and suffered a serious back injury that required months of rehabilitation. Unable to work, she retreated to her family home in Sydney. Soon after, Wall Street crashed and her mother became seriously ill. Faced with financial strain and family responsibilities, Letham had little choice but to remain in Australia – a twist of fate she would long regret. Back in Sydney, Letham derided the primitive state of local swimming education, and began teaching at pools throughout the northern suburbs. She was also an early proponent of synchronised swimming, and in the 1950s organised a “water ballet” at the Freshwater Ladies’ Swimming Club – an event inspired by the “rhythm swimming” she had observed at Berkeley several decades earlier. No longer a resident of the United States, her American citizenship was revoked in 1944. In 1961, Isabel Letham retired as a swim coach. Over the previous three decades, she had become an icon of Sydney’s northern beaches, known and beloved for introducing generations of children to the water. Still living in the family home near South Curl Curl, she swam daily in the sea. Later in life, Letham emerged as an enthusiastic champion of women’s incursion into the masculinist culture of Australian surfing. “There’s no reason why girls should not be as good on surfboards as the boys. I’m all for them,” she proclaimed in 1963. In 1978, she became a life member and patron of the Australian Women Board Riders Association, and in 1993 was inducted into the Australian Surfing Hall of Fame. She was an inspiration to a later generation of female surfers. Although it was a man who first made her famous back in 1915, Isabel remained fiercely independent and never married. She lived until the ripe old age of 95, passing away on 11 March 1995. A true water baby until the end, her ashes were scattered off Manly and Freshwater beaches. Isabel Letham features in a new episode of ABC radio’s Shooting The Past program called The Glide, exploring the history of surfing in Australia. It will air tomorrow at 11am on Radio National. John Howard’s Coalition won the November 2001 election, but the September 11 attacks had more impact on that outcome than the Tampa crisis. Many commentators have compared Labor’s support for the Medevac legislation with the Tampa incident in late August 2001. The implication is that Labor lost the 2001 election due to Tampa, and could lose this year’s election due to Medevac. Political commentator Katharine Murphy has said she was certain at the time Labor leader Kim Beazley “had just lost the election” after announcing Labor would vote against retrospective legislation giving the Coalition government the power to forcibly remove the Tampa from Australian territorial waters. But are the claims that Labor lost the 2001 election due to the Tampa true? 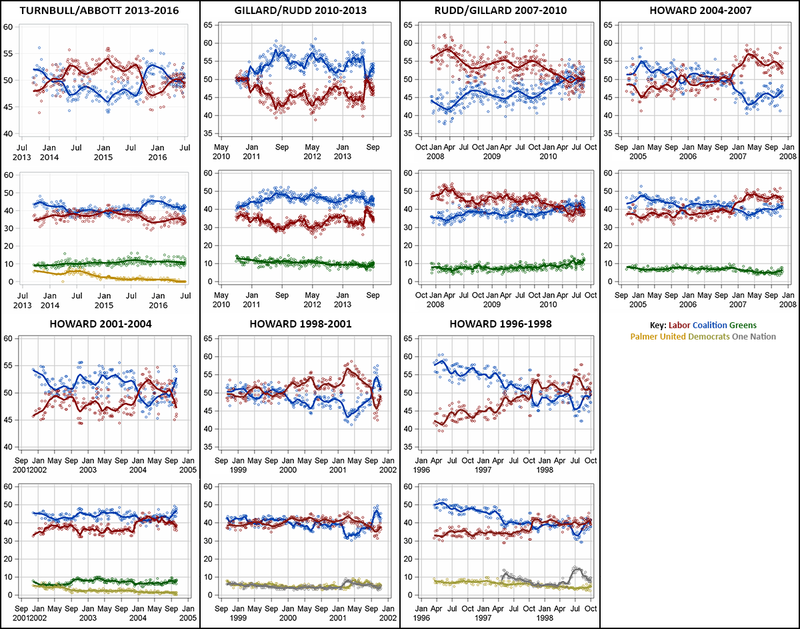 The Poll Bludger, William Bowe, kindly sent me the polling data for the 1998-2001 term, on which the historical BludgerTrack is based. BludgerTrack is a bias-adjusted poll aggregate. I have used this data to create the graph below of the Coalition vs Labor two party preferred vote during 2001. The election was on November 10. BludgerTrack two party preferred vote during 2001. The graph shows that Labor had a massive lead in March 2001 of about 57-43, but it gradually narrowed to about 52-48 by the time Australian government involvement in the Tampa incident began on August 26. The Tampa was denied permission to dock at Christmas Island and deliver asylum seekers who had been rescued. The Coalition received about a two-point boost from the Tampa affair to draw level with Labor. However, it had a much bigger lift from the September 11, 2001 terrorist attacks, which lifted the Coalition’s vote five points to about a 55-45 lead. As the shock of the attacks wore off, the Coalition’s vote fell back to a 51.0-49.0 victory on election day (November 10). If the Tampa had occurred in 2001, but not September 11, other issues, such as the economy, health and education, would probably have appealed to people in the lead-up to the election more than boats. Labor could have recovered to an election-winning position. September 11 made national security a huge asset for the Coalition government at the 2001 election. If not for September 11, Labor may have won the 2001 election. The Tampa put the Coalition into a tie with Labor, not a lead. Analyst Peter Brent in Inside Story thinks that, given economic factors, the Coalition would probably have won the election by 51-49 without either the Tampa or September 11. You can achieve this result by drawing a line from the Coalition’s nadir in March to the election, with the assumption that the slow improvement in the polls had continued. However, the graph shows the Coalition’s recovery had stalled for over a month before the Tampa. Even though the September 11 shock had faded by the election, the boost it gave to the importance of the Coalition strength of national security assisted the Coalition at the election. Labor did not lose the 2001 election because of the Tampa, and they are unlikely to lose the 2019 election because of their support for the Medevac bill. I believe the shock factor of terrorist incidents has been reduced by their frequency. There were two terrorist atrocities shortly before the 2017 UK general election, yet UK Labour performed much better than expected at that election. On Monday, seven UK Labour MPs resigned from their party to form The Independent Group. In the next two days, another Labour MP and three Conservative MPs also resigned to join The Independent Group. While other causes, such as alleged antisemitism within Labour, have been cited, the reason these defections have happened now is Brexit. The defecting MPs are strongly opposed to their former party’s handling of Brexit, and all want a second referendum on Brexit – currently opposed by both major parties. The Independent Group MPs have consistently voted in favour of proposals to avoid a “no deal” Brexit when the UK leaves the European Union on March 29. However, these MPs votes will not change. To avoid a no deal, either other MPs votes must change, or the major parties need to reach a compromise. The next important Brexit votes will be on February 27. The article I wrote on my personal website in January about why a no deal Brexit is a plausible scenario is still relevant. Detail of the Connecticut Inscription, with image enhancement. Rock inscriptions made by crews from two North American whaleships in the early 19th century were found superimposed over earlier Aboriginal engravings in the Dampier Archipelago. Details of the find in northern Western Australia are in a paper published today in Antiquity. They provide the earliest evidence for North American whalers’ memorialising practices in Australia, and have substantial implications for maritime history. At the time, the Dampier Archipelago (Murujuga) was home to the Yaburara people. The rock art across the archipelago is testament to their artists asserting their connections to this place for millennia. So did the whalers encounter the Yaburara? Did they engrave over earlier Aboriginal markings as an act of assertion, a realignment of a shifting political landscape? Or were they simply marking a milestone in their multi-year voyages, celebrating landfall after many months at sea? The answer to all these questions is, we don’t know. But these inscriptions provide a rare insight into the lives of whalers, filling a gap in our knowledge about this earliest industry on our northwestern coast. Such historical inscriptions might be dismissed as graffiti. However, like other rock art, they tell important stories about our human past that cannot be gleaned from other sources. Ship-based whaling was a global phenomenon that lasted centuries. At its peak in the mid-19th century, around 900 wooden sailing ships were at sea on multi-year voyages, crewed by around 22,000 whalemen. Most whaling in Australian waters was conducted by foreign vessels, and in the 19th century North American whalers dominated the globe. Illustration of an American whaling ship in the 19th century. Whaling led to some of the earliest contacts between American, European and a range of indigenous societies in Africa, Australasia and the Pacific. But early visits by foreign whalers to Australia’s northwest are poorly documented given the absence of a British colonial land-based presence in the area until the 1860s. While explorer William Dampier named the Dampier Archipelago and Rosemary Island in 1699, British naval Captain Phillip Parker King was the first to document encounters with the Yaburara people in 1818. His visit to the archipelago in the rainy season (February) coincided with large groups of people using the seasonally abundant resources at this time. The Swan River Colony (Perth) was established in 1829, but permanent European colonisation of the northwest only began in the early 1860s with an influx of pastoralists and pearlers. For the Yaburara, this colonisation was catastrophic. It culminated in the Flying Foam Massacre in 1868 in which many Yaburara people were killed. A few surviving ship logbooks record English and North American whalers on the Dampier Archipelago from 1801, but the heyday of whaling near “The Rosemary Islands” was between the 1840s and 1860s. The logbooks describe American whaling ships worked together to hunt herds of humpback whales, which migrate along Australia’s northwest coastline during the winter months. The ships’ crews made landfall to collect firewood and drinking water, and to post lookouts on vantage points to assist in sighting whales for the open boats to pursue. Research by archaeologists from the University of Western Australia working with the Murujuga Aboriginal Corporation and industry partner Rio Tinto has found some evidence of two such landfalls in inscriptions from the crew of two North American whalers – the Connecticut and the Delta. The earliest of these inscriptions records that the Connecticut visited Rosemary Island on August 18 1842. At least part of this inscription was made by Jacob Anderson, identified from the Connecticut’s crew list as a 19-year-old African-American sailor. Research shows this set of ships’ and people’s names was placed over an earlier set of Aboriginal grid motifs. This was along a ridgeline that has millennia of evidence for the Yaburara producing rock art and raising standing stones and quarrying tool-stone elevated above this seascape. The dates and names found in the inscription correlate with port records that show the Connecticut left the town of New London in Connecticut, US, for the New Holland ground (as the waters off Australia’s northwest were known) in 1841, with Captain Daniel Crocker and a crew of 26. Connecticut inscription, tracing by Ken Mulvaney. The Connecticut returned to New London on June 16 1843, with 1,800 barrels of oil, travelling via Fremantle, New Zealand and Cape Horn. The largest of the Connecticut inscriptions showing micro-analysis of the inscription over the Aboriginal engravings. The Connecticut’s logbook for the voyage is missing, so without these inscriptions we would know nothing of this ship’s visit to the Dampier Archipelago. On another island, another set of inscriptions record a visit to a similar vantage point by crew of the Delta on July 12 1849. Details of the Delta inscriptions. Registered in Greenport, New York, the Delta made 18 global whaling voyages between 1832 and 1856. Its logbook confirms it was whaling in the Dampier Archipelago between June 2 and September 8 1849. The voyage of the Delta as researched from Log Book entries. While the log records crew members going ashore to shoot kangaroos and collect water, no mention is made of them making inscriptions or having any contact with Yaburara people. Given it was the dry season, and the lack of permanent water on the islands, this lack of contact is not surprising. But again, these whalers chose to make their marks on surfaces that were already marked by the Yaburara. By recording their presence at these speciﬁc historical moments, the whalers continued the long tradition of the Yaburara in interacting with and marking their maritime environment. Between 1822 and 1963, whalers killed more than 26,000 southern right whales (Eubalaena australis) and 40,000 humpback whales (Megaptera novaengliae) in Australia and New Zealand, driving populations to near-extinction. Commercial whaling in Australian waters ended 40 years ago on November 21 1978, with the closure of the Cheynes Beach Whaling Station in Albany, Western Australia. Today there are signs of renewal, with whale populations increasing, and Aboriginal people are reclaiming responsibility for management of the archipelago. There is a strong push for World Heritage Listing of Murujuga — one of the most significant concentrations for human artistic creativity on the planet, recording millennia of human responses to the sustainable use of this productive landscape. These two whaling inscriptions provide the only known archaeological insight into this earliest global resource extraction in Australia’s northwest – the whale oil industry – which began over two centuries ago. They demonstrate yet again the unique capacity of Murujuga’s rock art to shed light on previously unknown details of our shared human history. An undated portrait thought to depict Bennelong, signed “W.W.” now in the Dixson Galleries of the State Library of New South Wales. that described by the celebrated poet, “so saying, swaying back and forth, he launched his long-shadowed spear”. Jr. the teenage son of the ship’s captain, and Benjamin Bowen Carter, the ship’s surgeon. taught English and serve as a cultural intermediary, he was later taken to England, returning to his homeland in 1795.
unusually messy payback punishment, which they recorded in excruciating and bloody detail. Benjamin Page Jr., Ann & Hope logbook, 1798-1799, Brown & Ives Records, Box 715, folder 1, John Carter Brown Library, Rhode Island. eminent historians and popular authors that depicted him as lost between two worlds, comfortable in neither. restore a sense of balance and to effect a form of closure. their hands, of killing an enemy when alone or unguarded. that the appropriate punishment had been met. and beating themselves at a terrible rate at length. sucking the blood from the wound after several were speared through the legs & thighs. ceremony challenges much of the outdated historiography about him. as Shino Konishi, Keith Vincent Smith, Kate Fullagar, and Emma Dortins. violent as to be capable of any mischief”. authority or from visiting American sailors’ notice. build a memorial on the land where Bennelong is buried certainly could not come at a better time. quote at the top of this page. The Victorian firefighter dispute comes to a resolution, but for how long? The sea cucumber, or trepang, Australia’s first export to Asia. Kathleen McArthur (left) and Judith Wright (right) wildflowering at Currimundi in 1961. Portrait of Kathleen McArthur by Lina Bryans (1960). The Cooloola campaign postcard, 1969. Christmas Bells by Kathleen McArthur. Just a few of the flood of letters Kathleen received during the Cooloola campaign, from the WPSQ collection held at the State Library of Queensland. Vanilla Lillies by Kathleen McArthur. Kathleen McArthur in the early 1960s. Kathleen refocussed on her art, wrote a suite of books and established a series of monthly presentations called “lunch-hour theatre”. She remained involved with her local branch of the wildlife preservation society, prepared the submission to have Pumicestone Passage added to the register of the National Estate, and campaigned to protect beach dunes. She also identified areas that should be protected as reserves, including one posthumously named Kathleen McArthur Conservation Reserve just north of Lake Currimundi. After a period of illness she died in 2000, the same year as her friend Judith Wright.